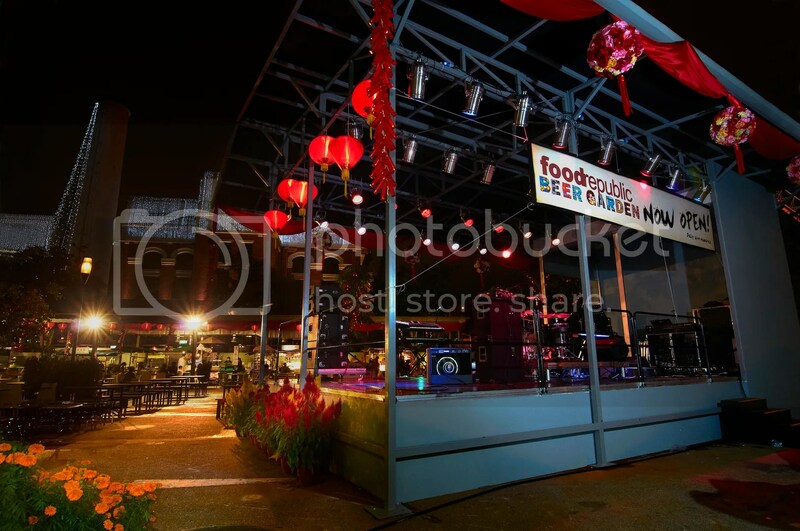 Food Republic Beer Garden – Need A Supper Place? 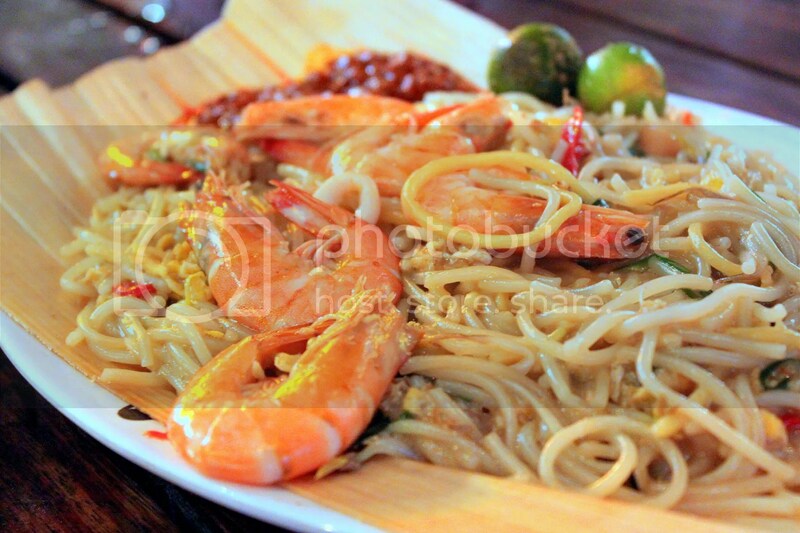 Let’s take a short break from all the atas Restaurant Week meals and cover some hawker fare! 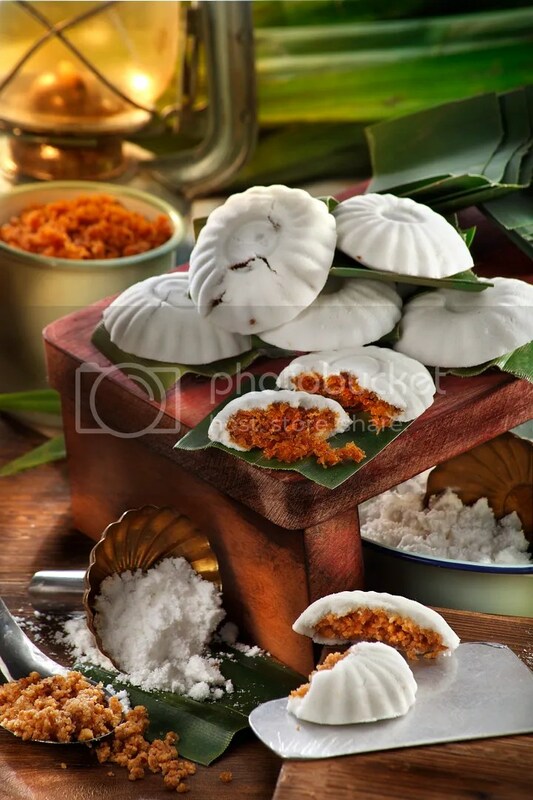 Surely you must have heard of the Makan Sutra Gluttons Bay @ Esplanade right? Well, Food Republic has done something very similar, bringing together a collection of famous hawkers under one retractable roof that they call Food Republic Beer Garden. 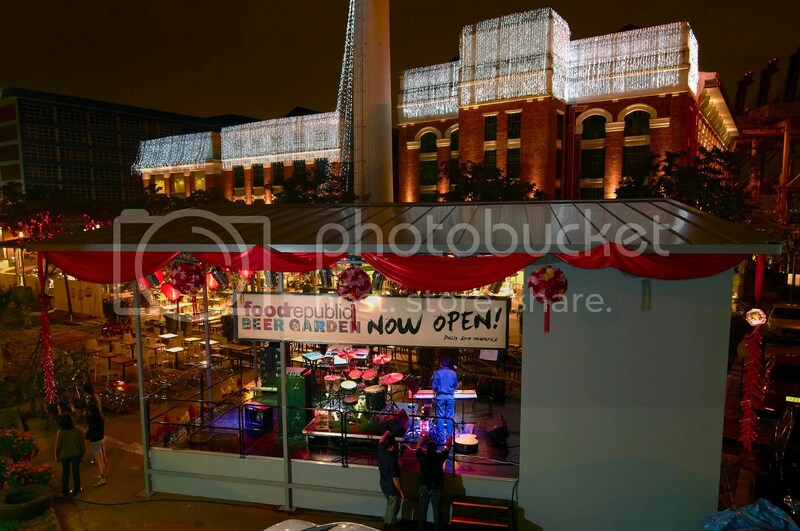 Located just outside St James Power Station, it is a collaborated effort between the BreadTalk Group (who owns Food Republic) and St James Holdings, where Food Republic manages the food stalls while St James handles the alcoholic drinks Stall. Opening hours are from 6pm to 5am (opens till 6am on Fri-Sun), catering to the working crowd who want to place to grab a cheap beer over some hawker fare, tourists coming from a day out at Sentosa, hungry locals looking for supper and revelers who just want to have a snack or drink after a night of partying. I was down for an invited tasting last week and that was actually my first time hearing of the place. After all, I’m more of a Zouk and Velvet person than a St James person. 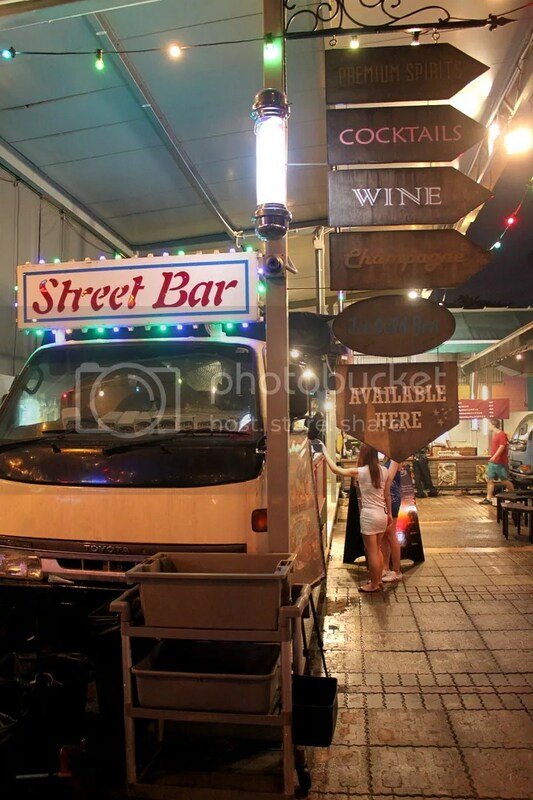 Launched a year ago, the theme of the 400-seater open-air Food Republic Beer Garden likens that of a scene straight out of Singapore in the 60s, where you see pushcarts, truck stalls and kiosks selling all manner of Singapore-style hawker fare. There’s also live entertainment here, where a chinese band comes on stage and plays a few sets throughout the night. There are quite a couple of decent stalls here but I will only be covering what I feel is worth coming back for. And I apologize that I’m going to be using some of their professional taken photos and I want to mention beforehand that they might not represent exactly what you might end up getting upon order. 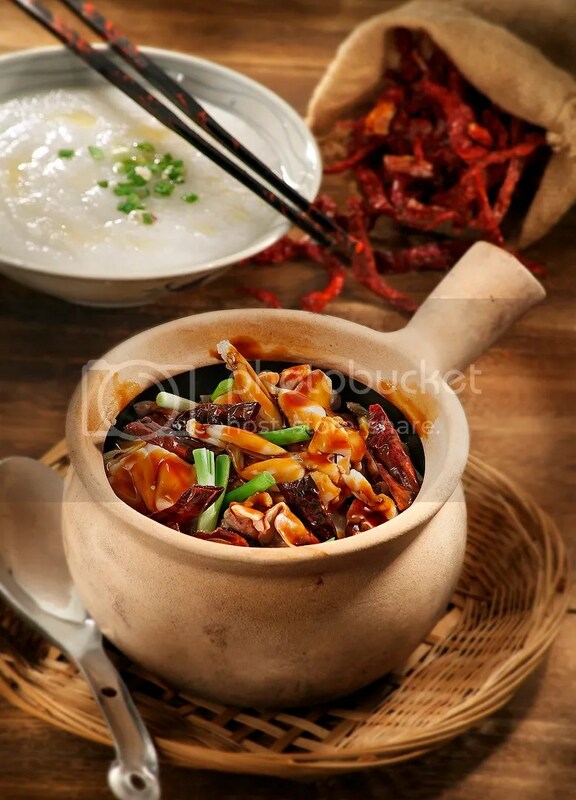 The first on my list would definitely be the Kung Pao Frog Leg Porridge ($8/reg). The stall here is a branch from the famous Lorong 9 Geylang Frog Leg Porridge. This was so awesome that a week after the tasting, I headed down to Geylang to relive this wonderful memory and it was just as good! The congee was smooth, the frog leg tender with a winning kung pao sauce that complemented the congee well with a mix of savouriness and spiciness (chili padi was probably used in addition to the dried chili). I dare say this is one of the best Kung Pao Frogs you can get in Singapore. Anyway the difference between porridge and congee has always troubled me so here’s what differentiates the two. 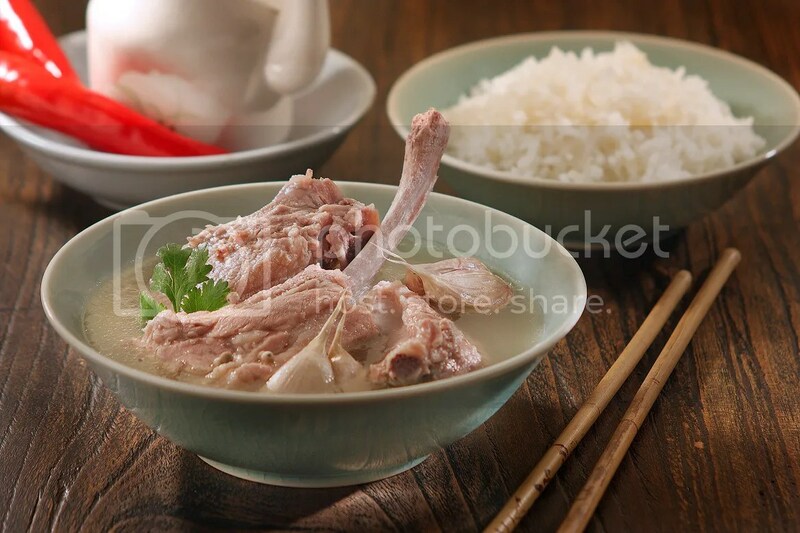 Congee is a subset of porridge, and usually made using rice while porridge can be made using oats, cereals and grains. My relationship with Tutu Kueh goes way back. I remember about 15 years ago, there was a NTUC opposite the former National Library at Marine Parade and within this NTUC, there was a stall selling Tutu Kueh and everytime I accompanied my mum for grocery shopping, we never failed to get some. It was one of my childhood guilty pleasures, alongside KFC and Muah Chee. Coming in flavours of peanut and coconut, I always had a hard time deciding what to get. Now that I’m older with more pocket money, the answer comes so much more easily, get both. Tutu Kueh stalls are quickly dying out in Singapore, so if you haven’t tried it before, do visit Chinatown Tan’s Tutu Kueh Kiosk, where your Tutu Kuehs ($0.60 each) are prepared a la minute. Two other stalls that trail closely behind is the Bak Kut Teh and Hokkien Mee. The Bak Kut Teh stall here is named Balestier Bak Kut Teh, but given that I have yet to try any of the numerous Bak Kut Teh shops at Balestier, I can’t testify if this is the real deal. Still, it’s hard to find fault with a Bak Kut Teh ($6.50) that has pork ribs whose meat falls off the bone. 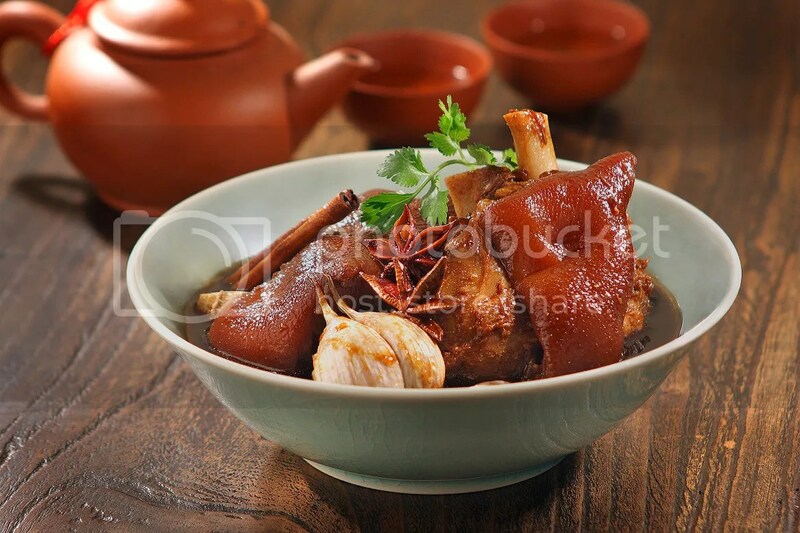 A clear peppery soup base is used for this Bak Kut Teh with just the right zing. Surprisingly however, the stall’s Pig Trotters ($6.50) doesn’t fare just as well. The trotters failed to absorb the flavours of the spices and the braising could have been executed better. I asked Joy, our lovely PR correspondent for the night which was her favourite dish here and she pinpointed the Thye Chua Fried Hokkien Mee ($7). 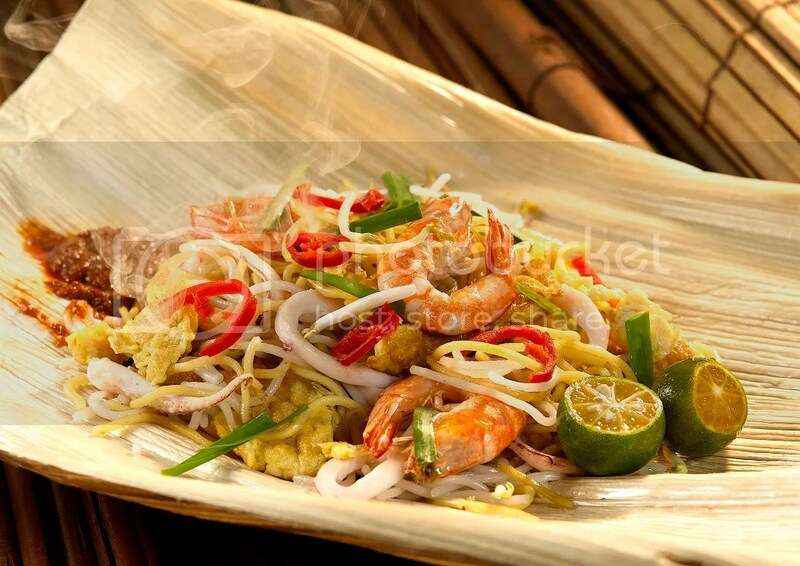 Served on an opeh leaf, the hokkien mee was a “wet version” with a very fragrant stock base, sure to appease one’s locally attuned tastebuds. Last but not least, there is a Rojak stall called Aunty Jessie Rojak that serves pretty interesting Rojak renditions. Rojak means “mixed up” in Malay so who is to say what can or cannot be used as mixing ingredients? 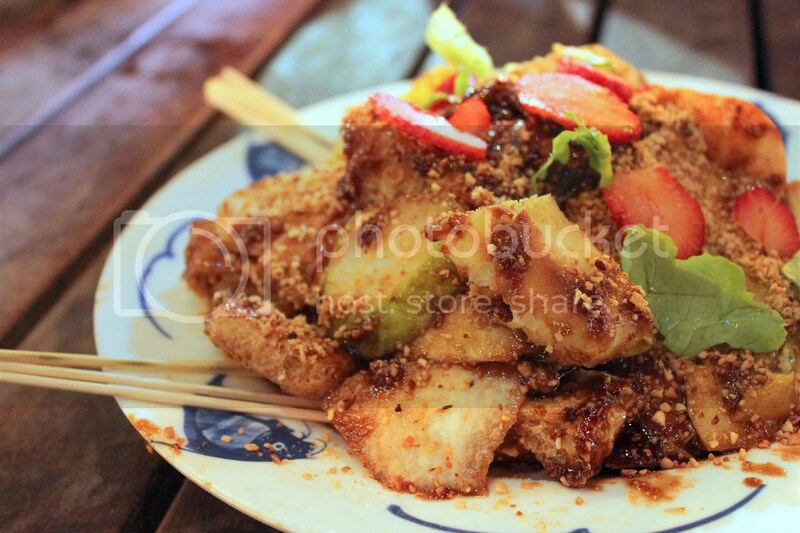 Their more conventional Black Rojak uses the usual Youtiao, Cucumbers, Peanuts and dark Prawn Paste Sauce, while in their White Rojak ($7), you get to see strawberries and a tangy Sour Plum Sauce is used instead. The Sour Plum Sauce tastes a little similar to the Lemon Lime Sauce you get at Aston’s, so while some might find the combo weird, I found it very appetizing as a meal starter. On the whole, I find lots of potential in Food Republic Beer Garden. The standards here are definitely above the average hawker centre or food court, but just like Gluttons Bay @ Esplanade, hawker food here is priced at a slight premium given the impending inflow of tourist traffic and live entertainment. I choose to believe that I will return in the near future, for supper beckons. Special Thanks to Food Republic for organizing this tasting session! Categories : All YumYums in my TumTum, Asian, Budget, Cuisine Type YumYums, Invited Tasting, Yummy!